Google Inbox, Google’s optional alternative to the standard Gmail layout Google Inbox Review: A Breath Of Fresh Air Google Inbox Review: A Breath Of Fresh Air Gmail is a household name in the email department, but Google wasn't content with it. Meet Google Inbox, a new way of approaching email. Read More , aims to make sure that you see the most important messages you’ve received. With the Chrome extension Inbox by Gmail [No Longer Available], you can save articles from your browser to your Inbox. Whether in the web or mobile versions of Inbox, saved articles will all appear in one bundle. Expanding that bundle will show the full list. Clicking on a link will open up the story on the original website. There is no way to save articles for offline viewing, and it doesn’t have Pocket’s ability to offer a clean, ad-free version display of the article. Why Use Google Inbox Instead? The way that the service functions, you can use Google Inbox as a to-do list 10 Super Efficient Ways Inbox by Gmail Saves You Time 10 Super Efficient Ways Inbox by Gmail Saves You Time Inbox by Gmail is Google's most recent approach to email organization and management. It can give you a simpler email workflow. Find out if Inbox by Gmail can be the better choice for you. Read More . 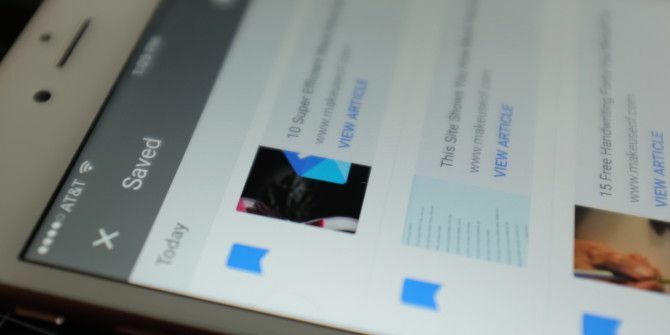 If you’re saving articles are part of your workflow, Google Inbox might just make that process easier by incorporating your reading list into that. You can also add alerts for individual articles, so if there’s something you need to be reminded to read, Google Inbox will let you know. And, lastly, it might be helpful to have everything available in one app or tab. If you prefer a tagged or organized read-it-later experience, Google Save might be the preferrable option for you. Again, saved articles can’t be read offline, but you can tag saved articles to keep things under control. Would you use Google Inbox instead of Pocket? Let us know in the comments. Explore more about: Google Inbox, Pocket. What i don't realize is in reality how you're no longer actually a lot more neatly-preferred than you might be now. comes to this subject, produced me in my opinion consider it from a lot of numerous angles. discount nba jerseys.Where to order dr jerseys outlet? I only use internet for that purpose, and get the latest news. Extremely useful info specifically the final part :) I maintain such info a lot. Where to buy cheap authentic jerseys? Come here. cheap jerseys 2 you,it's your pleasure to buy it with free shipping. paypal free shipping factory, free shipping and easy returns also best service. Google Inbox. Nice! How have you ever receive this sort reputable writing ability? Can it be some employees together with response to persistence. to have your or just I’ll get wrong our research project . But yet, try not to rely, it’s truly a so what understand relating to this website Dolores. store of the NFL,NHL,NBA,MLB,soccer,NCAA, supply super saturday nfl shop promotional codes from China. Discount all kinds of china jersey websites, free shipping. Ebay same style Nike 91 Ryan Kerrigan Elite Burgundy Red Home Mens Jersey NFL Washington Redskins to offer. Khalil Mack Black Team Color Mens Stitched NFL Elite Jersey? Here is 78 Bobby Richardson Jersey varous sizes, which is crazy fashion now. What might you suggest about your submit that you simply made a few days ago? Great place to order 13 Rashad Greene Jersey by Paypal. What's up mates, pleasant article and good urging commented at this place, I am in fact enjoying by these. For most recent information you have to go to see the web and on the web I found this web page as a best web page for most recent updates. One major problem with the Google Inbox (app) is that, if you have filters set up for processing emails to specific labels (especially those that you have skip the inbox), using Google Inbox (app) nullifies that setting, and your filters apply the required label but do not archive from the Inbox. I have a *lot* of filters set up to whisk emails out of the inbox into 'folders' (aka labeled), but upon trying Inbox all of my filters stopped the archival process, making a huge mess of my inbox. a) on desktop it works only in Chrome. Not my browser of choice both on PC or Android - and lot of people agree with that. b) For mobile devices it doesn't save articles offline. Major drawback. c) Lot of people - like me - like to partition. For me Inbox (and rest of googleland) is for 'semiserious stuff' - ie bills,email notifications, tasks, while pocket(combined with feedly) is for more interest-related. Mixing different parts of life in one app is invitation for distraction and creating mess. 1 more way for Google to become encrusted in your life's fabric. I know, it is appealing to make use of all its integrated, easy-to-use, free services, but at what (future) price? Just go look at the Google graveyard. so you will never use a good service just because of a thought, that it can be closed? and are you sure Pocket (a small startup of several people) will last forever? not a bad idea but there is an bookmarklet or an extension to save directly an article to inbox (like Pocket extension)? Did you have a different browser you prefer to use? Yes, I use Firefox and Chrome. Thanks, I must be blind! !